Adventures In Uglyworld: Uglyworld #21 - Wage asks "Can I Drive This Old Train Car?" 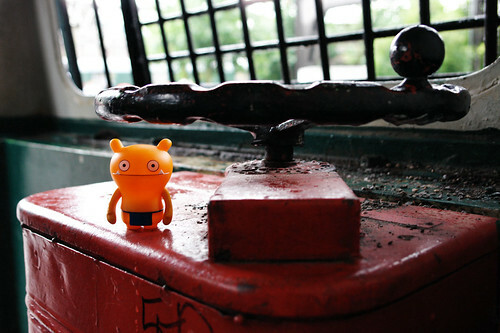 Uglyworld #21 - Wage asks "Can I Drive This Old Train Car?" Uglyworld #21 - Wage asks "Can I Drive This Old Train Car? ", originally uploaded by www.bazpics.com. After he had scoffed down his packed lunch Wage was reinvigorated and full of energy, so much so that as the rest of us prepared to investigate more of the park the little fella was off at about 200mph (or at least as fast as his legs could carry him) in the direction of an old train car. Two minutes or so later when the rest of us caught up with him we found him hanging from the steering wheel making "toooot, toooot" noises, which he promptly stopped upon noticing the rest of us standing laughing at him.